Queens Of Sheba is taking place at The Vaults, Waterloo. For any access needs please contact the Vaults Box Office directly on 0208 050 9241. Turned away from a nightclub for being “too black”, four women take to the stage with their own explosive true stories. The music and the misogyny, the dancing and the drinking, the women and the (white) men. 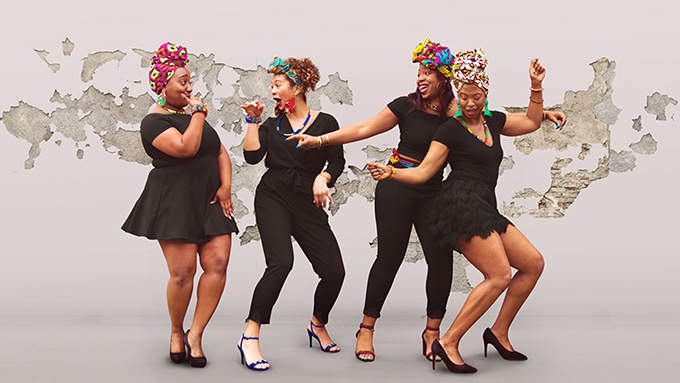 Loosely based on the DSRKT nightspot incident of 2015, Queens of Sheba tells the hilarious, moving and uplifting stories of four passionate Black Women battling everyday misogynoir – where sexism meets racism. Written by Jessica L. Hagan and devised by the company. Nouveau Riché is an exciting, diverse, multi-award winning, creative movement. Developed on Starting Blocks at Camden People's Theatre, following sell out runs at Edinburgh Fringe and New Diorama, Nouveau Riché, winners of The Untapped Award 2018 and an Edinburgh Stage Award, are reviving Queens of Sheba for VAULT Festival 2019. WINNER! 2018 Underbelly Untapped Award. WINNER! 2018 Edinburgh Stage Award. Nouveau Riché is an exciting, diverse, multi-award-winning creative movement, headed by a team of performance artists. Discovering, nurturing and producing unique stories from all walks of life, Nouveau Riché make culturally inclusive work that is educational and entertaining, across all art forms.